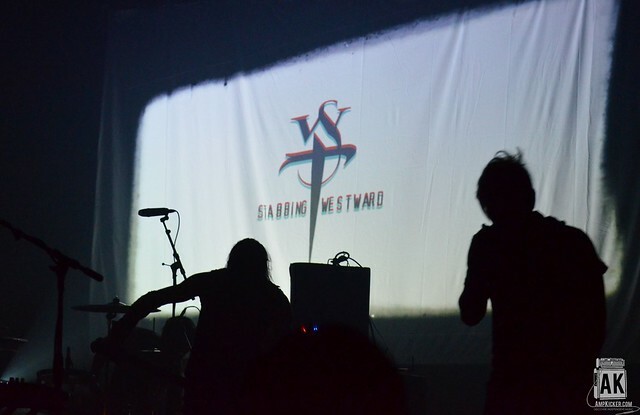 Stabbing Westward was my gateway band into my musical upbringing of my teenage years. I was 16 when Darkest Days came out, complete with an all black wardrobe and the ball-chain necklace, leather wrist bands, total walking teen angst. This band helped me cope with so much going on. My friends all loved them, too and there were many a nights rocking their albums Ungod, and Wither, Blister, Burn, and Peel. and I’ve carried that fandom through the past 20 years following singer Chris Hall with The Dreaming, and back again. 20 years later and it’s like they haven’t skipped a day. To this day, they still sounding so on point and fresh as they did back then. I was so grateful to see them again on their FIRST day of this incredible tour. They rocked the album start to finish, playing songs they’ve NEVER played live before. They added visual elements to the show with clips of ‘Duke Nukem Time To Kill‘ during ‘The Thing I Hate’ and in-game free-fall sky diving footage from GTAV during ‘On Your Way Down’ as bodies fell to the earth timed perfectly to the melody. After the album tracks were finished, the band came out for an encore of hits including ‘So Far Away‘ from their final Self-Titled album, and from Ungod ‘Violent Mood Swings‘, ‘Lies‘, and ‘Nothing‘ and wrapping up the show with ‘Shame‘ of course. It was fantastic to see these guys again, and I’m so glad their all back together and I’ll be so excited if we hear new music from them soon. The Hollow - Interview / Review of "Let Me Never Be Complete"